so, i said in a previous post that i had originally bought the black ones in a size smaller hoping they’d stretch out a little, as they fit me length wise. well, after a few weeks of wearing them round the house and contemplating, they still didn’t fit comfortably enough! 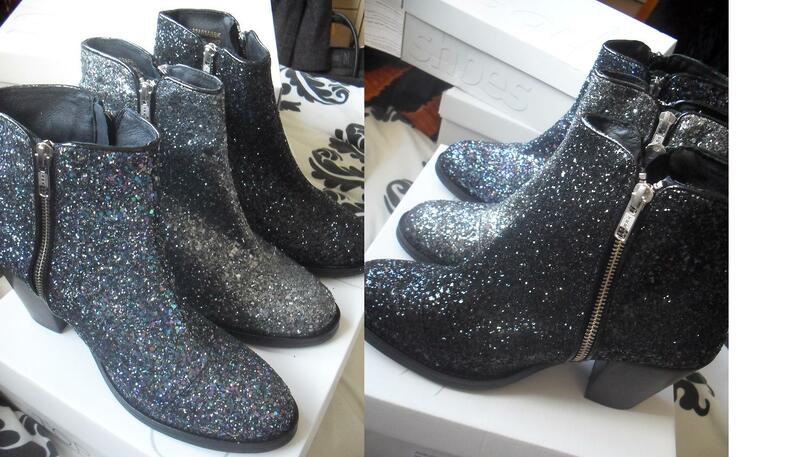 then, topshop said on twitter the other days that they restocked the glittery boots so i was on like a flash having a browse. i saw the navy ones first and ordered them straight away without thinking that they might have the black ones. it was only when i was bored in my magazine writing class the next day that i noticed they had all the colours in! so, i then bought the pewter and black ones (in the correct size), thinking that when they arrived i’d decide which ones i liked best and take one back. only problem is that i now like all 3!